How to get there If you go from Livigno (1818m) or bypassing Livigno starting at 1850m in Italy, this is a rather easy pass. The same is true if you come from Passo del Bernina/Pass dal Bernina/Berninapass (2328m), even if the bit from La Motta (Dogana) (2055m) is somewhat steep (up to 13-14%). 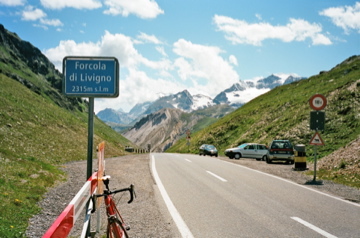 However, if you come all the way dwon from Tirano (438m) in Italy, then this is a really hard and long pass climb!